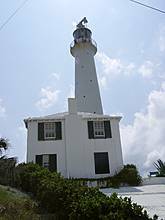 Bermuda is closer to the U.S. Coast than I would have thought. It is less than 700 miles of the coast of South Carolina. If you are a U.S. citizen, you don't need a passport, a birth certificate is fine. Also, their currency is pegged one to one with the U.S. dollar and all the stores accept U.S. money, though your change may be in a mix of the two. 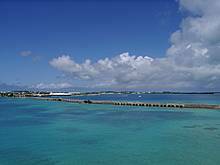 Bermuda is a string of islands about 20 miles long. A large part of their economy is based on tourism so expect lots of tourists. Since the islands are so small, it is possible to visit just about everything in a week. I went for five days in early June, 2002. To view a picture, click on the thumbnail image or its description. Taken from our hotel balcony, looking over the water at the causeway that connects two of the Islands. 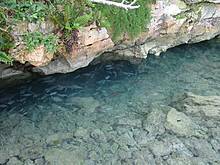 Fish swimming under a rocky overhang. a Purple and white flower growing on a vine. 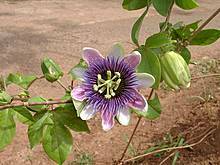 The Passiflora caerulea is used to make perfume. 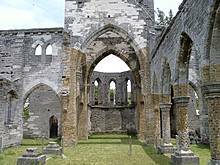 From the back, looking to the front, where the altar would have been. 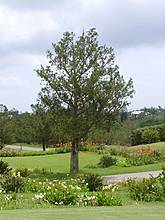 Bermuda has a native cedar that used to be used to build ships and was nearly wiped out by disease. This house is named Camden. 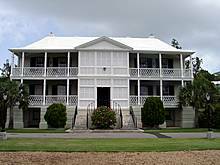 It is the offical residence of Bermuda's Premier. She (or He) doesn't live there, it is only used for official functions. 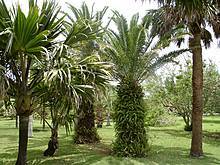 Several palm trees, ferns are sprouting on one of the palm tree. 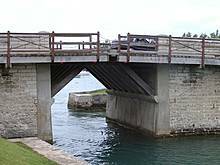 This is the narrowest drawbridge in the world. At eighteen inches wide it is only wide enough to let the mast of a sailboat through. 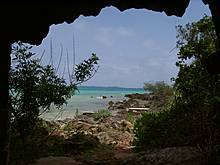 Inside the cave looking out at the water, the jagged cave entrance subtely intrudes on the picture. 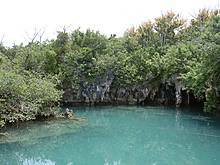 The bright blue water contrasts with the green plants around it. 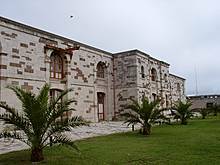 A restored building in the victualling yard. Copyright 1995-2011, G. Edward Johnson. All rights reserved.